A lot has been written in the newspapers lately about the ice skating trail at Arrowhead Provincial Park near Huntsville, Ontario, so Bob and I decided, on our last visit to the area, to give the icy surface a whirl. Never before having visited Arrowhead Provincial Park, we paid close attention to the signs that directed us in the right direction. 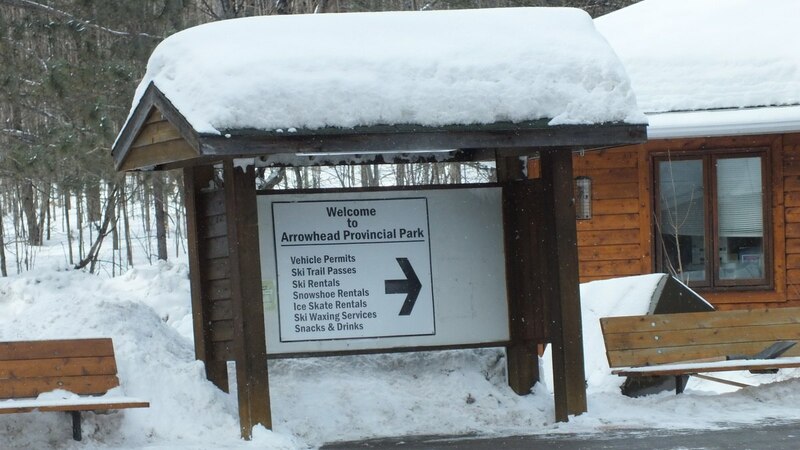 Arrowhead is not a huge park, only 12.37 square kilometres, but it offers a good variety of winter activities and rental of equipment in support of those outdoor pursuits. 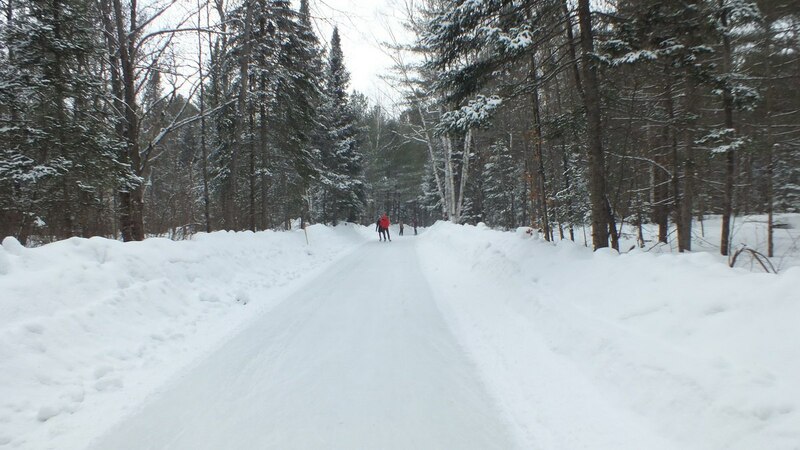 We are always looking for a new take on winter sports, and the 1.5-kilometre ice skating trail winding its way along campground roads and trails seemed intriguing. Set amidst snow-dusted trees in the East River Campground, the trail makes an enchanting alternative to skating circles around a rink. 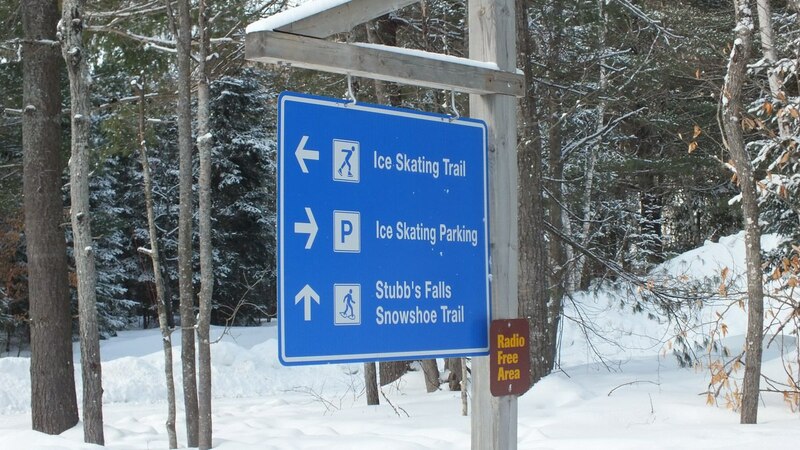 When first we arrived at the Park Gate, a sign was posted saying that the skate trail was closed for the day. We were thoroughly disappointed but pressed on and found workers on the scene of the ice path. 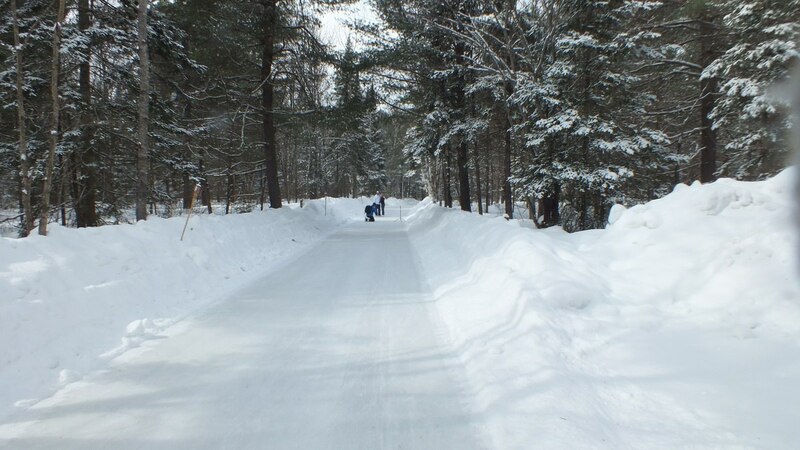 They indicated that they would be finished watering the surface down in about 45 minutes, so we went for a 5-kilometre ski around the impeccably trackset Arrowhead Lake Cross-country Ski Trail while we waited for the ice to be ready. 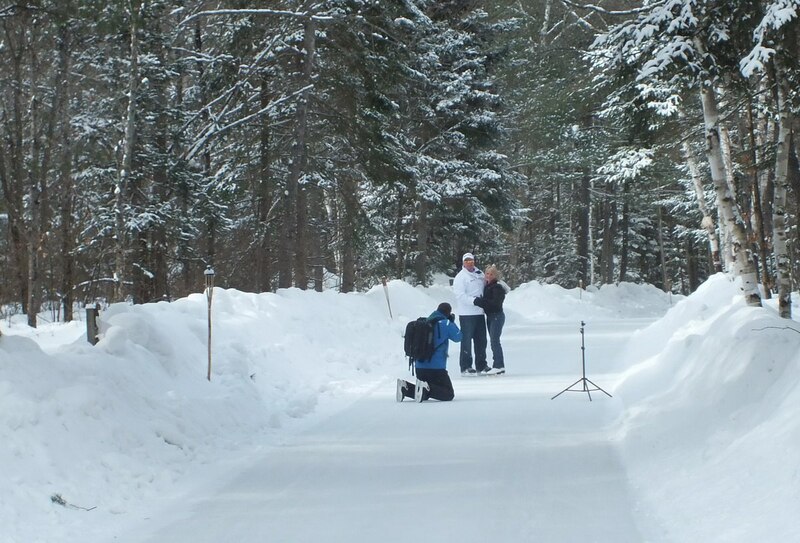 When we returned to the skate trail, other enthusiasts were there ahead of us already lacing up their skates. 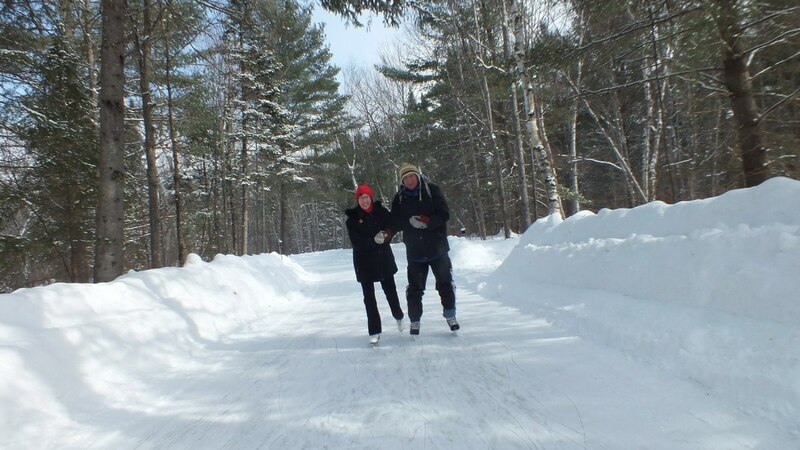 Park benches and picnic tables were made available for people to sit on, and once we had our boots safely tucked out of the drifting snow, Bob and I made for the freshly surfaced ice. A handy sign pointed the way. It was quite a different experience as we soon realized that we were coasting down a slight grade with no need to propel ourselves. That soon changed, however, when the roadway underlying the ice’s surface had to surmount a slight hill. Bob and I had to dig in our heels in order to move forward up the grade. It required a modest effort. 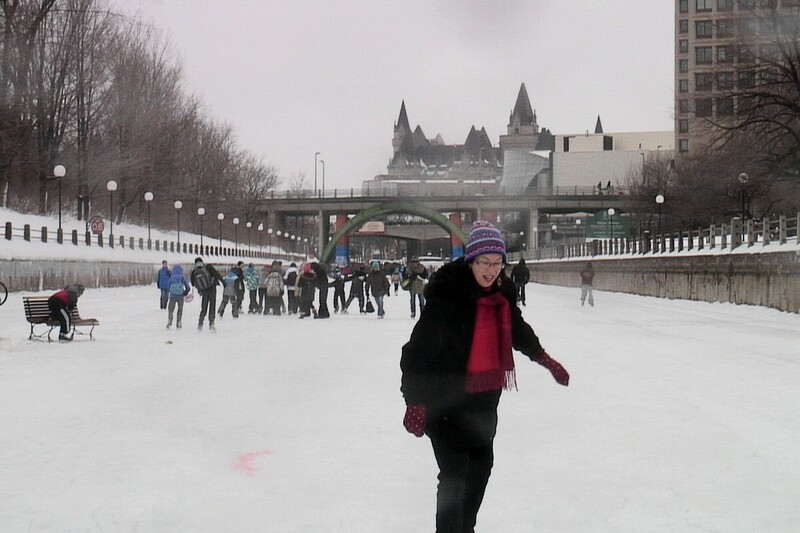 We have been to Ottawa several times where it is possible for people to skate on the frozen Rideau Canal Skateway. 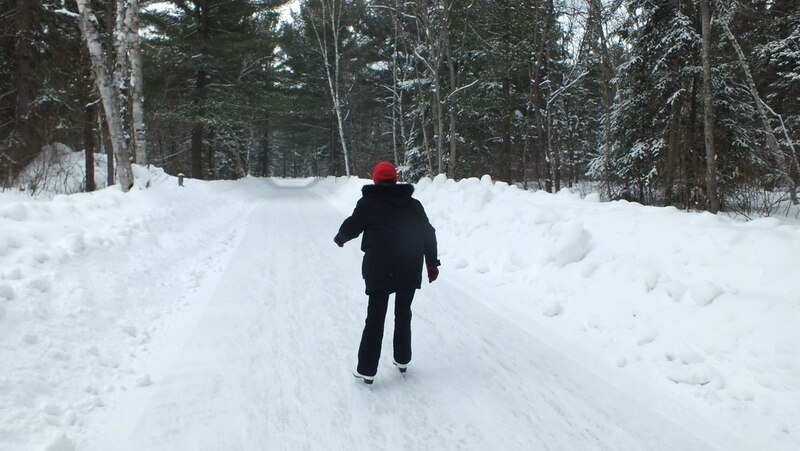 I always love that you can skate for kilometres towards Dow Lake at one end of the canal and then make the return trip thereby occupying a good half day or more. A parade of food stalls lines a good section of the canal where skaters can rest and refresh themselves, and the breadth of the frozen surface is capable of handling any amounts of people who show up to enjoy the outdoor winter activities. 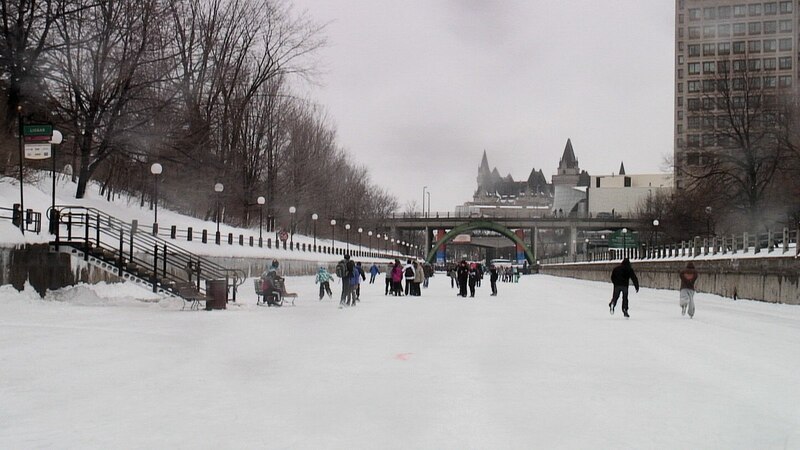 So when we heard of the ice skating trail at Arrowhead, we thought it might mirror that experience provided by the Rideau Canal Skateway. There were few skaters on the ice when we visited, given that the ice skating trail was technically closed for the day, so we took full advantage of the lack of crowds to enjoy the peace and tranquility of the setting. 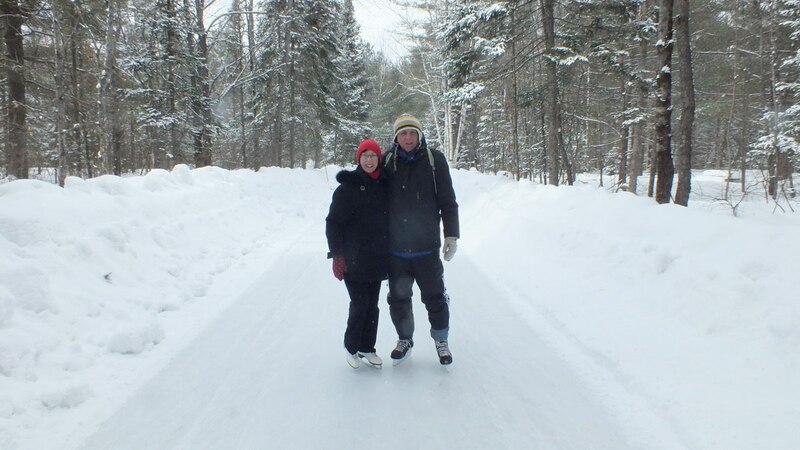 The trail is wide enough to allow fellow skaters to pass with ease, and we were grateful for the lack of commercial enterprises. At any moment, we expected some curious creature to edge its way from the protection of the forest to the brink of the snowbank along the ice surface for a peak at the odd humans gliding by on winged feet. 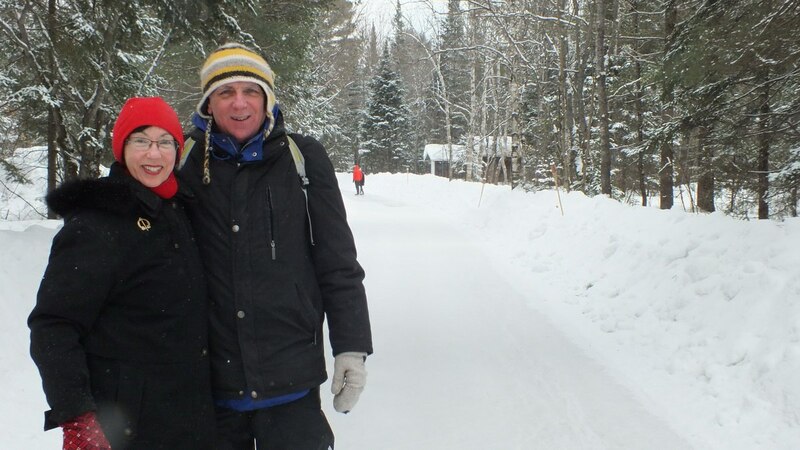 Sadly, the only forest dweller to show itself was a diminutive red squirrel, but that did not dampen our excitement at having seen a beaver earlier that day along the ski trail. The condition of the ice, itself, was not quite up to par according to the staff applying water to its surface, but then again, we and others had come upon them at mid-task. Having said that, the sections of the skate trail where the newly-applied water had frozen provided a fairly smooth skate comparable to most outdoor rinks. 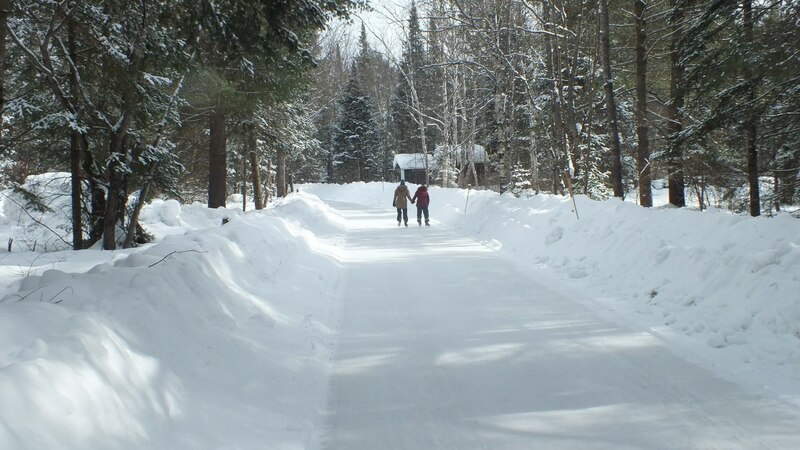 Arrowhead Provincial Park is the only park with an Olympic-style resurfacing machine, and the benefits of that equipment can definitely be seen. 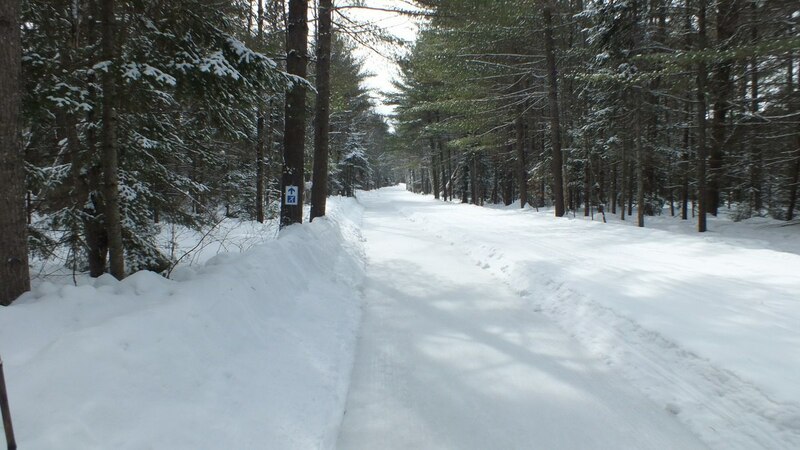 The skate trail has become quite the destination for couples seeking a unique location to make a wedding proposal, or for a romantic date night. Several Saturday evenings throughout the winter months, the park features the forest by firelight. That is when the ice trail is illuminated by flickering tiki torches that cast a small circle of light into the deep, silent forest. Shrouded in darkness, the experience would be complete because skaters can pull up at scattered bonfires to warm their toes, toast a marshmallow or savour a cup of hot chocolate. Under a full moon or even a starry night, it would make for a magical winter evening. Although Bob and I missed our opportunity for an intimate skate beneath the stars, I rather preferred being able to see my surroundings in more detail. Long shadows fell across the icy surface and scrambled up the snowbanks when the late winter sun poured its heart into the treetops, and on that frigid morning, it was a blessing that helped to compensate for the brutal wind. We made three circuits around the skate trail before deciding it was time to go and get some lunch. A long drive lay ahead of us in order to reach home before dark, but Arrowhead had given us a great source of exercise before getting behind the wheel and left us with a fond memory of what winter is all about…getting out there and enjoying the snow, the ice, and the cold temperatures. We love it! 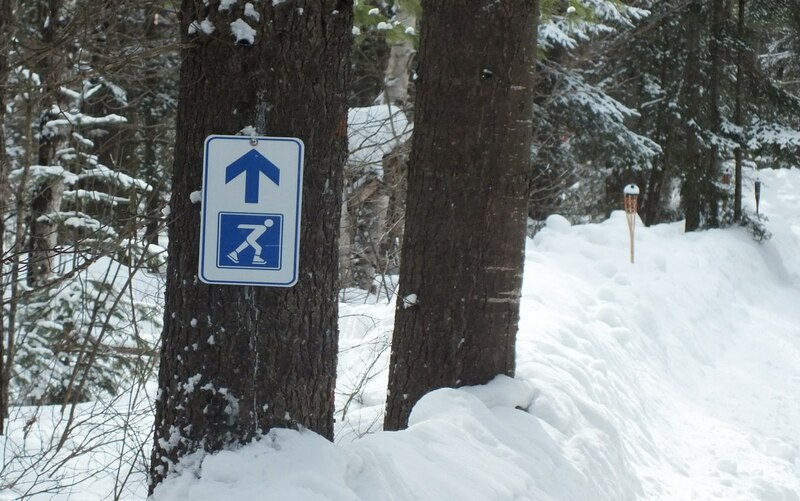 this looks like a really great skating trail! thanks for looking at our story, Blake. Indeed, it was very pleasurable skating through the woods. We were sheltered from the wind by the evergreen trees, and the forest made for an interesting backdrop as we completed the circuit. 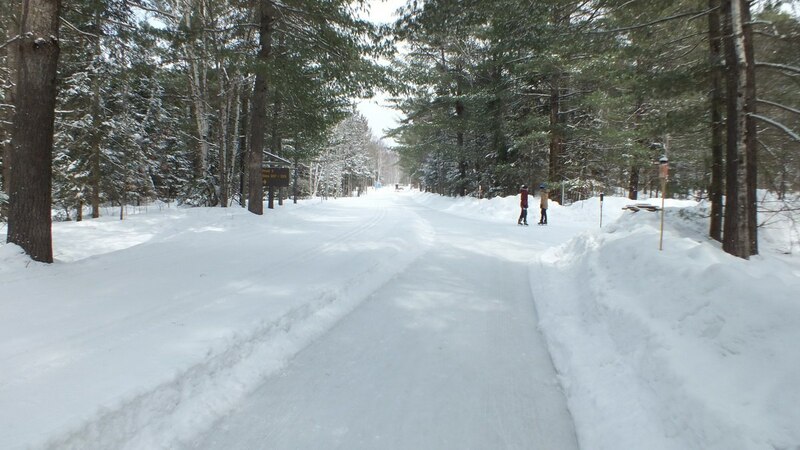 An ice trail makes so much sense because on an ice rink, people skate around the perimeter most of the time anyways.